BELLAIRE GOBLET WORKS/U.S. GLASS original Daisy & Cube aka Stars and Bars miniature amber oil lamp. 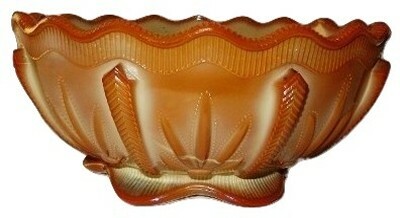 The Early American Pattern Glass (EAPG) design is called "Daisy & Cube" was first designed in the late 1800's. Listed and pictured as figure S1 482 on page 200 in the book "Miniature Lamps" by Frank & Ruth Smith. Measures 7 3/4"" high in total. The shade measures 2 1/8" high X 3 1/4" across the top and 1 7/8" across its bottom rim which has normal mold removal roughness inside the opening from the manufacturing process. The base with its original SPAR BRENNER burner stands 6 3/8" tall and measures 3" across the base. No chimney with this example yet they are easily found for sale. Other than the noted manufacturing seam chipping inside the shade opening there are no chips, cracks or repairs. 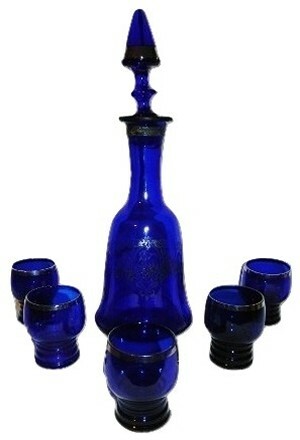 Vintage cobalt blue decanter and cordial set. 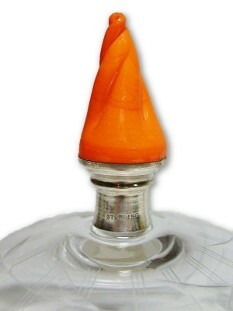 The decanter measure 11 1/2" high and 4" across at the widest point and the stems measure 2 1/2" X 1 3/4". 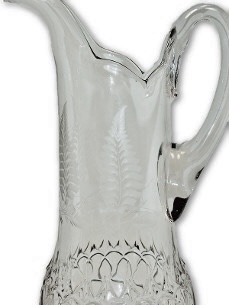 No chips, cracks or repairs wear to the silver enamel especially on the decanter and the pattern appears to be a woman with a flute and a cherub surrounded by garland. 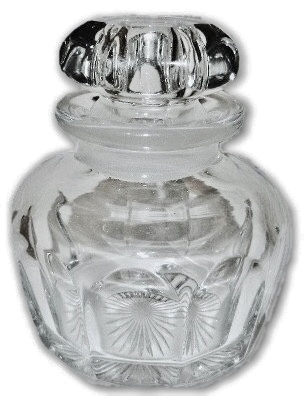 Crystal covered condiment jar with wheel engraved flowers and lines. 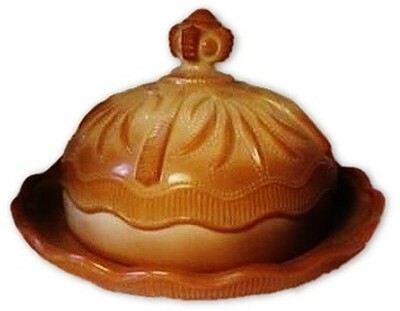 The crystal ladle is tipped with an orange flame finial, while the lid has a marked STERLING original collar and a finial of matching orange flame shaped glass. The original notched lid fits very nicely into the base. We believe this item to be Czechoslovakian circa 1925. 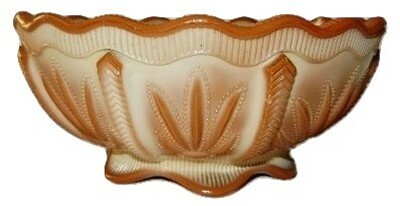 Stands 8" tall and measures 3 1/2" across at its widest point. Original matching ladle measures 7 1/2" in length. No chips, cracks or repairs. English cut glass dresser box with silver and vermeil handled lid. 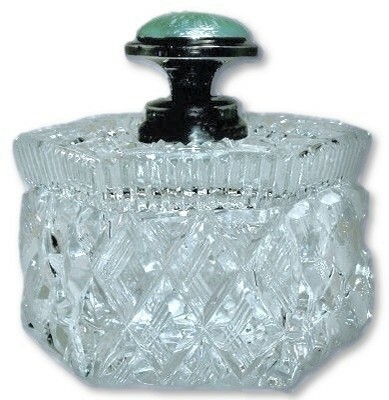 This absolutely beautiful brilliant cut glass dresser box has and all over deeply cut patterns on a thick crystal body. 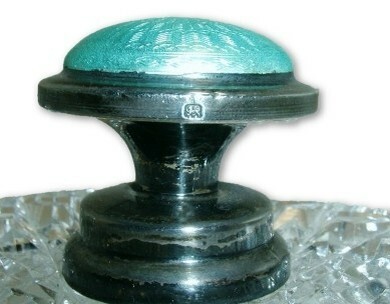 The lid has an unpolished handle with a stunning blue vermeil top. The box measures 4" X 4". 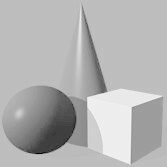 The silver finial has a crisp hallmark of a lion head. 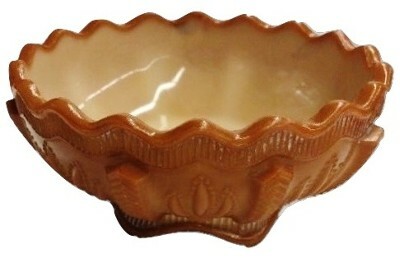 The interior rim of the lid has a shallow clam shell shaped chip and the base interior edge has a tiny edge flea bite flake and a very small bruise which is still intact and not completed to a chip. No other damage or repairs. 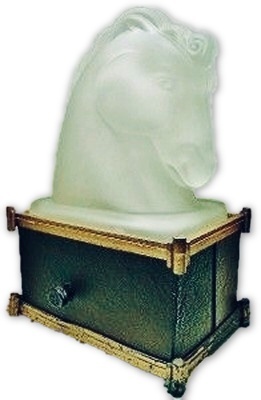 FEDERAL GLASS COMPANY frosted horse head night light and original base. We have seen this particular combination only a few times. 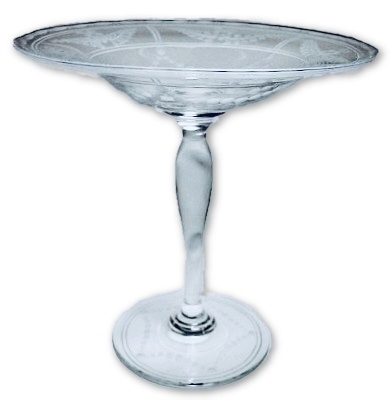 The glass has a few condition issues, two bottom edge chips that are mostly obscured by the base rim that it sits upon as well as a very small flake in the mane of the horse head. The base is made of patinated white metal. Due to age, use and the many years of heat inside the light box, there is some wear, stress and warp to the white metal frame. The original Bakelite style on off bulb switch with the letter P is intact, while the hardware has been rewired. There is one screw missing. 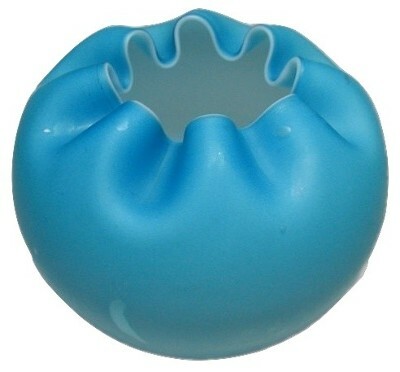 Fenton cased satin blue rose bowl with crimped rim. White interior. Measures @ 3 3/4"height- 4 1/4" diameter Unmarked with pontil on base . No chips, cracks or repairs, bubbles are present between the cased glass layers all are closed. 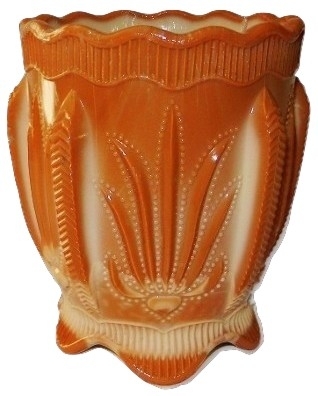 FENTON RUBY PEACH CREST satin glass vase. 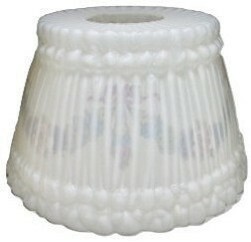 This wonderful item has a fine candy ribbon ruffled top. The very edge is of satin colorless glass while the exterior shades from a soft pink down to almost white at the base. 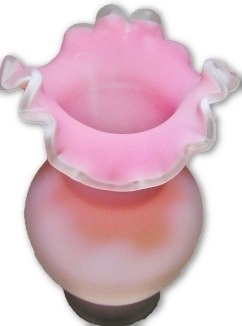 The interior of this vase is bubble gum pink and shades to white. This item also has a pontil mark. This item 5 3/4" X 3 1/2". No chips, cracks or repairs. Pair of Elegant Glass "FOSTORIA COLONY" Candlesticks. 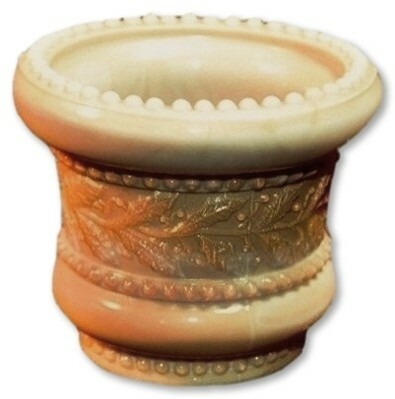 This set has a nice overall swirl pattern and a raised lip to insure a nice fit for your candles. 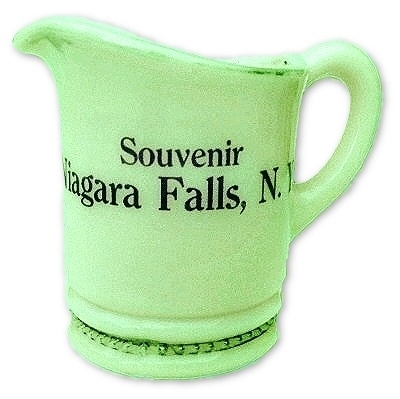 Fostoria produced this pattern from 1938-1982 and we know that this set was part of a wedding gift given in the late 1930's! The sticks each measure 3 1/2" High and 4 1/4" across the base. No chips, cracks or repairs. 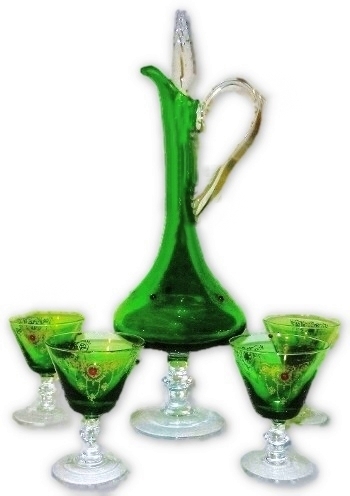 Vintage green and crystal cordial set. There are applied ruby red glass jewels and a stenciled gold pattern. 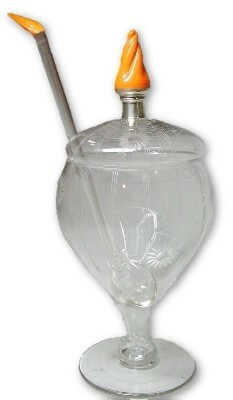 The stopper is crystal as is the handle and stems. 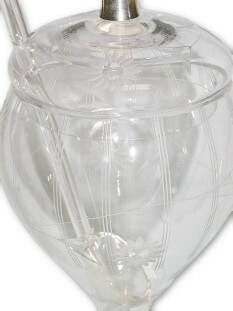 The decanter measure 14" high and 4 1/2" across at the widest point and the stems measure 3 1/2" X 2 7/8". No chips, cracks or repairs some wear to the gold enamel especially on the decanter. Greentown chocolate glass cactus pattern covered butter dish produced by the Indiana Tumbler and Goblet Co. in Greentown Indiana 1894-1903. Measures 4 3/4" X 7 1/4". A tiny flea bite flake on the wave to the base and normal edge roughness . No other chips, cracks or repairs. 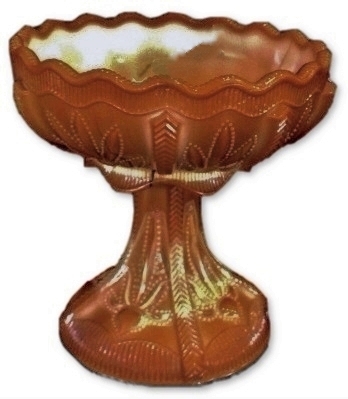 Greentown chocolate glass cactus pattern small berry bowl produced by the Indiana Tumbler and Goblet Co. in Greentown Indiana 1894-1903. Measures 4 1/8" across and sits 1 3/4" high. A very small top rim flat flake and a tiny open bubble along with the normal edge roughness . No other chips, cracks or repairs. 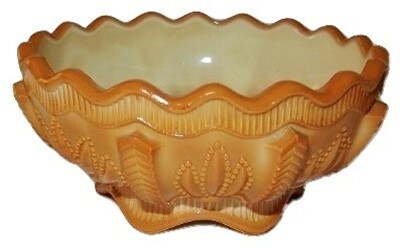 Greentown chocolate glass cactus pattern small berry bowl produced by the Indiana Tumbler and Goblet Co. in Greentown Indiana 1894-1903. Measures 4 1/8" across and sits 1 3/4" high with the normal edge roughness. No chips, cracks or repairs. Greentown chocolate glass cactus pattern small berry bowl produced by the Indiana Tumbler and Goblet Co. in Greentown Indiana 1894-1903. Measures 4 1/8" across and sits 1 3/4" high with the normal edge ruffness. No chips, cracks or repairs. Greentown chocolate glass cactus pattern small berry bowl produced by the Indiana Tumbler and Goblet Co. in Greentown Indiana 1894-1903. Measures 4 1/4" across and sits 1 7/8" high with the normal edge ruffness. No chips, cracks or repairs. Greentown chocolate glass cactus pattern large berry bowl produced by the Indiana Tumbler and Goblet Co. in Greentown Indiana 1894-1903. Measures 7 1/4" across and sits 3 1/4". Outstanding mocha coloration inside and out with the normal edge ruffness. No chips, cracks or repairs. Greentown chocolate glass cactus pattern master berry bowl produced by the Indiana Tumbler and Goblet Co. in Greentown Indiana 1894-1903. Measures 8 1/4" across and sits 3 1/2". Several tiny flea bites along the seam edges and some very small factory created stress lines on the bottom of the feet normally found on this large size along with the normal edge ruffness. No other chips, cracks or repairs. 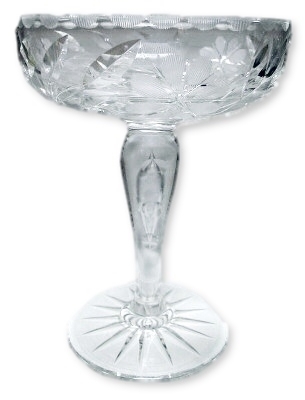 Greentown chocolate glass cactus pattern master compote produced by the Indiana Tumbler and Goblet Co. in Greentown Indiana 1894-1903. Measures 5 5/8" X 5 1/2" high. Outstanding striations of dark glass throughout the bowl and pedestal, with the normal edge ruffness. No chips, cracks or repairs. 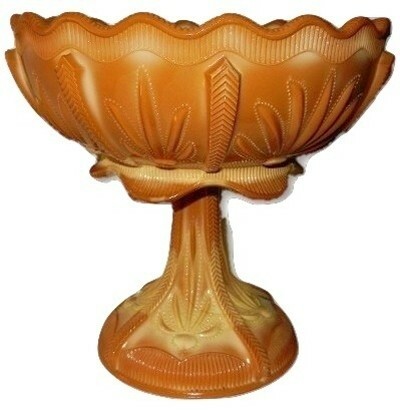 Greentown chocolate glass cactus pattern master compote produced by the Indiana Tumbler and Goblet Co. in Greentown Indiana 1894-1903. Measures 8 1/4" across and sits 7 7/8" high. Several bottom of the feet areas of edge flaking found on this large size feet of the upper bowl area along with the normal edge ruffness. No other chips, cracks or repairs. 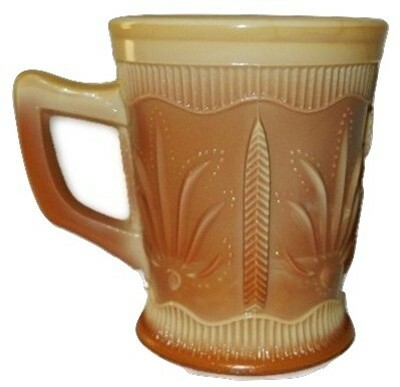 Greentown chocolate glass cactus pattern handled mug produced by the Indiana Tumbler and Goblet Co. in Greentown Indiana 1894-1903. Measures 3 1/2" X 4" X 3" with the normal edge ruffness. No chips, cracks or repairs. 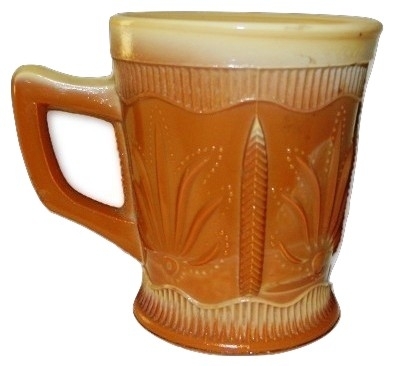 Greentown chocolate glass cactus pattern handled mug produced by the Indiana Tumbler and Goblet Co. in Greentown Indiana 1894-1903. Measures 3 1/2" X 4" X 3" with the normal edge ruffness and a small flat flake on the seam area of the handle. No other chips, cracks or repairs. 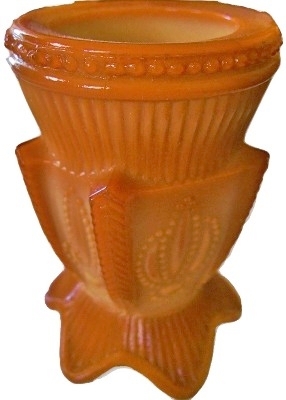 Greentown chocolate glass cactus pattern shaker produced by the Indiana Tumbler and Goblet Co. in Greentown Indiana 1894-1903. Measures 3 1/4" X 2" with the normal edge ruffness and a small flat flake on the seam area of the on one foot, a few on the top of the brackets along with some flakes to the beading. No other chips, cracks or repairs. 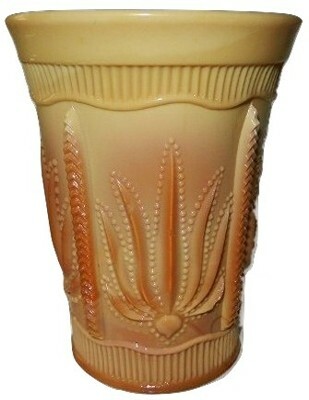 Greentown chocolate glass cactus pattern shaker produced by the Indiana Tumbler and Goblet Co. in Greentown Indiana 1894-1903. Measures 4 1/2" X 4" with the normal edge ruffness and a small what appears to be in the making stress line and 3/8" sliver of glass missing inside the upper section of the spooner. This does not appear to go through to the exterior of the piece though. No other chips, cracks or repairs. 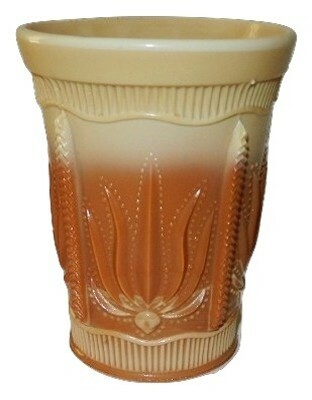 Greentown chocolate glass cactus pattern scarce large handled & lidded syrup produced by the Indiana Tumbler and Goblet Co. in Greentown Indiana 1894-1903. Measures 6 1/4" X 4 1/2" X 4" with the normal edge ruffness and a small flat flake on the seam area, a few on the top of the brackets also have small flat chips. The hinge the would have attached the rounded metal lid to the metal collar is no longer present and there is a fair amount of chrome loss to the metal hardware. No other chips, cracks or repairs. Greentown chocolate glass cactus pattern toothpick holder produced by the Indiana Tumbler and Goblet Co. in Greentown Indiana 1894-1903. Measures 2 3/4" X 2" with the normal edge ruffness and with some flakes to the beading. No other chips, cracks or repairs. Greentown chocolate glass cactus pattern toothpick holder produced by the Indiana Tumbler and Goblet Co. in Greentown Indiana 1894-1903. Measures 2 3/4" X 2" with the normal edge ruffness and a small flat flake on the top rim, along with some flakes to the beading. No other chips, cracks or repairs. 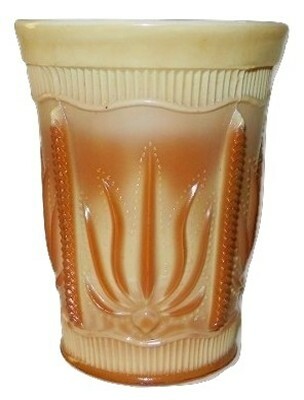 Greentown chocolate glass cactus pattern tumbler produced by the Indiana Tumbler and Goblet Co. in Greentown Indiana 1894-1903. Measures 4" X 3 1/8" with the normal edge ruffness and a very small rim manufacturing flaw. No chips, cracks or repairs. 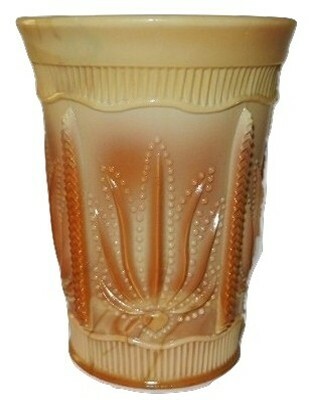 Greentown chocolate glass cactus pattern tumbler produced by the Indiana Tumbler and Goblet Co. in Greentown Indiana 1894-1903. Measures 4" X 3 1/8" with the normal edge ruffness. No chips, cracks or repairs. 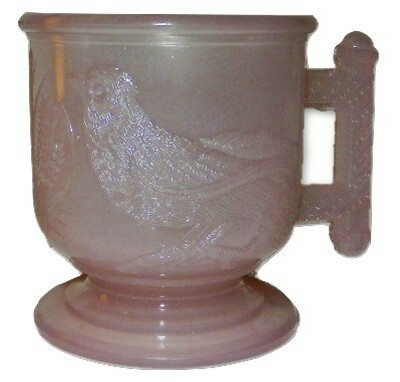 A.H. Heisey crystal Colonial pattern lavender jar. 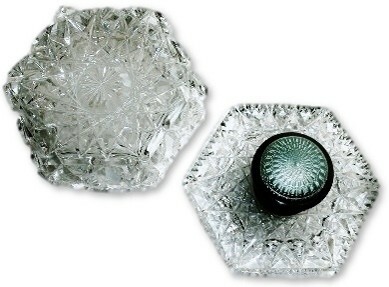 Signed with the capital H in a diamond and a star pattern on the base. Measures 4 3/8" X 3 1/4". No chips, cracks or repairs. 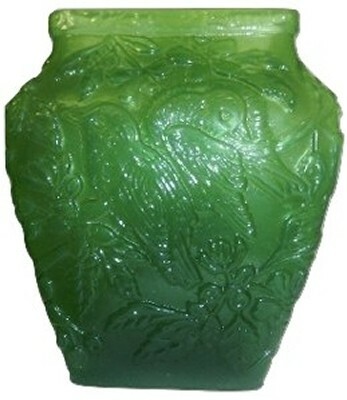 IMPERIAL JADE GLASS 6" HUN (Lovebirds) #51755 JA Vase. 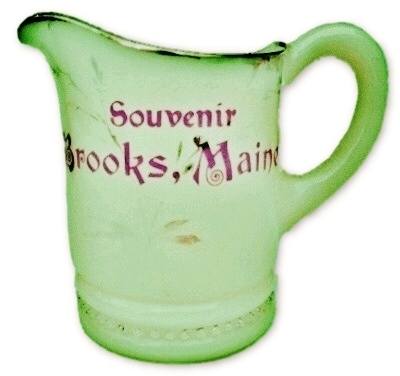 Imperial Jade Glass was produced circa 1960 and then again produced by Imperial for Lenox when they purchased the Imperial Glass Company in 1973. 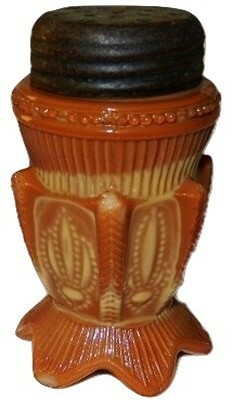 This vase has its original Paper Label on the base which reads; "IMPERIAL 51755 JA 6" HUN VASE". A small piece of vintage scotch type tape secures the original label in place. This item measures 6 1/4" X 5 1/2" X 3 1/2". No chips, cracks or repairs. Dark Jade Green 8 3/4" plate. 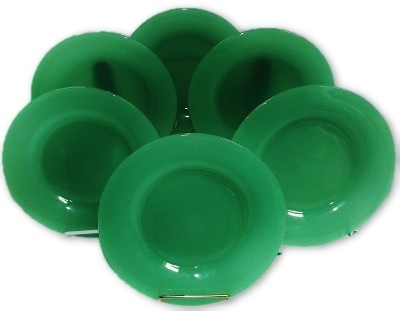 There are 6 matched plates available for purchase, priced each. Unsigned and ground/polished Marie pontil scar. Random straw marks and some light utensil wear. No chips, cracks or repairs. JEFFERSON GLASS Company Ring & Beads pattern CUSTARD GLASS Souvenir Brooks, Maine. 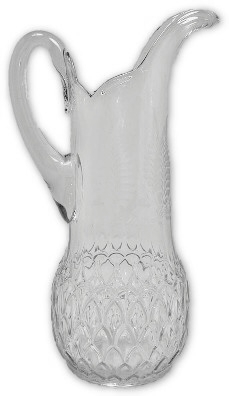 Miniature pitcher. This item measures 3" X 2 3/4". There is normal expected wear to the gold enamel while the red lettering is in excellent condition. No chips, cracks or repairs. 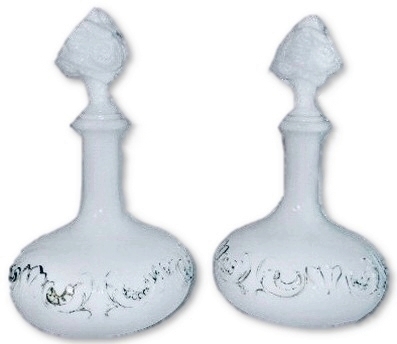 Pair vintage, possibly Victorian large milk glass decanter bottles. 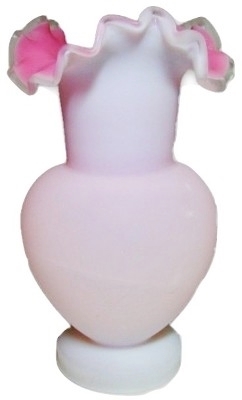 This set has a nice overall swirl pattern and the stoppers are shaped like roses and are almost opalescent glass. Measure 10 1/4" high and 5 1/2" across at the widest point. 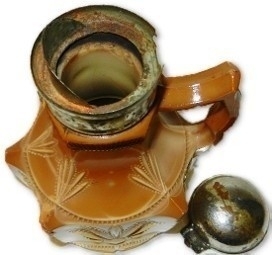 No chips, cracks or repairs some wear to the gold enamel and manufacturing roughness to the bottle openings. Hand painted milk glass cylinder form night light. This wonderful item has a snow scene with a country house tucked among trees at the end of a long drive. Brass plated original hardware. Stands 9 1/4" tall and about 5 3/4" across at the widest point. No chips, cracks or repairs. 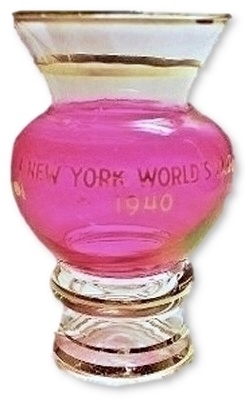 VINTAGE 1940 NEW YORK WORLD'S FAIR Ruby Flashed vase. This item measures 3 3/4" X 2 1/2". No chips, cracks or repairs with extremely minor loss to the gold. 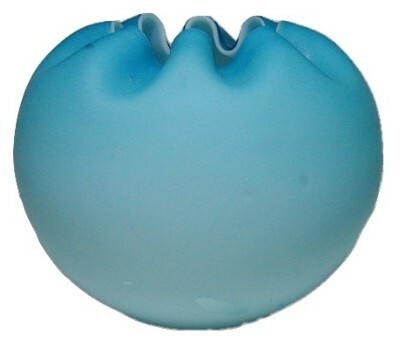 NORTHWOOD EAPG (Early American Pattern Glass) blue opalescent ARGONAUT SHELL/NAUTILUS pattern rolled edge card receiver. Measures 8 1/4" X 5" X 3". No chips, cracks or repairs. 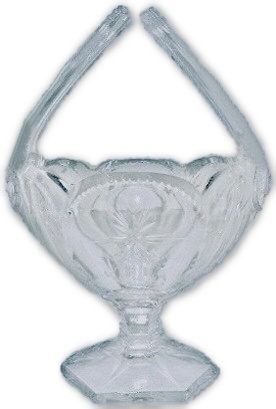 PAIRPOINT American brilliant period cut glass compote by the Pairpoint Company of New Bedford Mass during the first quarter of the 20th century. 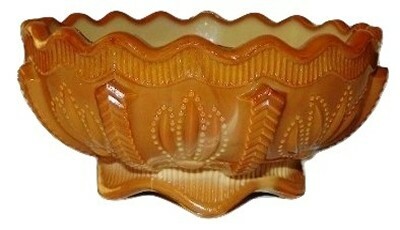 Stands 8 1/4" high while the bowl of the compote measures 6 1/8" across the top. No chips, cracks or repairs. Pairpoint Glass Company of New Bedford Mass. wheel cut in the #245 pattern. Stands 6 3/8" tall and 6 1/4" across the top. No chips, cracks or repairs. 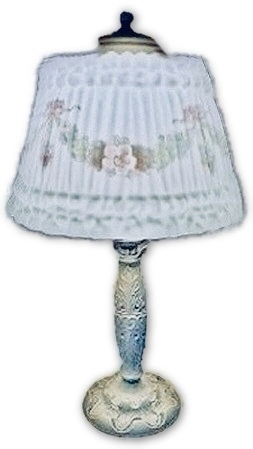 PITTSBURGH LINENFOLD style shade on original cast iron boudoir lamp base. 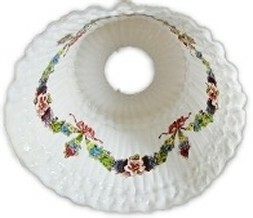 The satin finished exterior of the linen fold molded shade is reverse painted with swags of floral. There is only the slightest in the making edge grinding roughness. 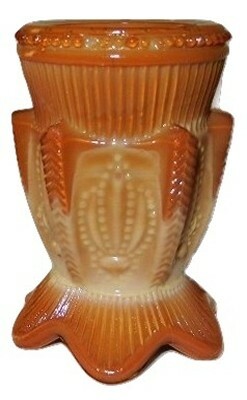 Though unsigned there are several books on elegant lamps of the early 20th century that show this shade and similar bases and all attribute them to "PITTSBURGH LAMP COMPANY" The overall height of the is 14 1/2" tall, shade measures 7 1/2" across the bottom, 5" across the top and measures 5" high. No chips, cracks or repairs. 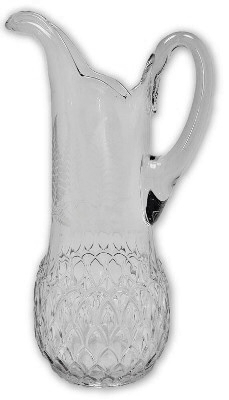 Smirnoff Eckau Kummel bottle was launched in the United States in 1934. 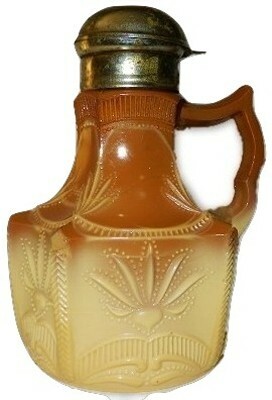 The sweet Kummel liquor which was flavored by Caraway Seed or Cumin came in a black bear shaped bottle. Measures 11" tall. No chips cracks or repairs. 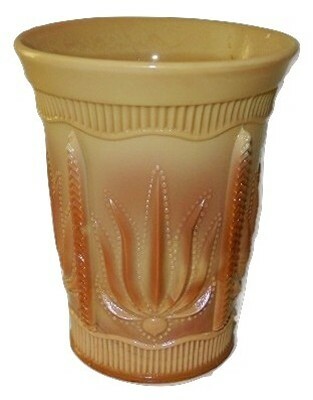 St Clair golden chocolate glass Holly pattern toothpick holder. Circa 1960's 3 part seam displaying the 1-2-3 berries at the seams. 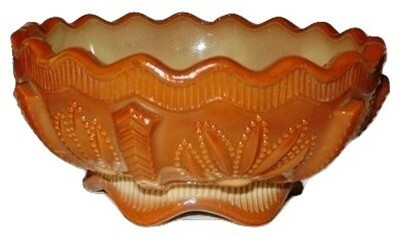 Measures 2 3/4" X 2 5/8". One tiny in the making open bubble and a 1/8" chip under the bottom edge. No other chips, cracks or repairs. 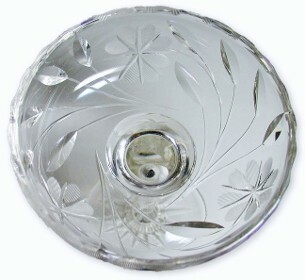 WESTMORELAND SPECIALTY GLASS COMPANY Grapeville, PA. Colonial 1700 pattern wheel cut crystal handled sugar. Lovely wheel cutting of a blazing star on the front and back of the basket as well as cutting along the seam of the handle. Measures 6" X 4" X 3 1/2". No chips, cracks or repairs.